Elinor DeWire is an author, educator, and a charter member of the U.S. Lighthouse Society. 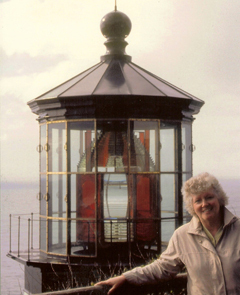 She has been researching, photographing, lecturing, and writing about lighthouses since 1973. Elinor has published seventeen books and numerous articles about lighthouses and related maritime topics. She has been a regular contributor to the U.S. Lighthouse Society’s Keeper's Log since it began publication in 1984. She writes a lighthouse blog and also contributes to several lighthouse newsletters. In the early 1990s she developed a lighthouse unit for her elementary classroom and eventually turned it into a consumable book called The Lighthouse Activity Book for Kids. Some of the pages, stories, and activities from the book appear under the “Education” link on this website. Elinor has received numerous awards for her work, including the Coast Guard Book Award, the Ben Franklin Book Award, and the National League of American Pen Women Short Fiction Award. She has served on the boards of directors for several lighthouse groups, including the Keepers of Point Robinson Lighthouse and the New Dungeness Light Station Association. Elinor is a popular public speaker and also visits schools and youth groups to talk about lighthouses. When not working on lighthouse-related projects, she teaches at Olympic College in Bremerton, Washington. She holds an M.A. in Education from the University of Connecticut.